What began as a simple kitchen renovation in Monica and Michael Miller’s 1950s bungalow in Oak Bay, evolved into a six-month-long labour of love. The resulting first-floor expansion truly celebrates the couple’s passion for colour and Mexican colonial architecture. Soft archways were added to the home to define each room. 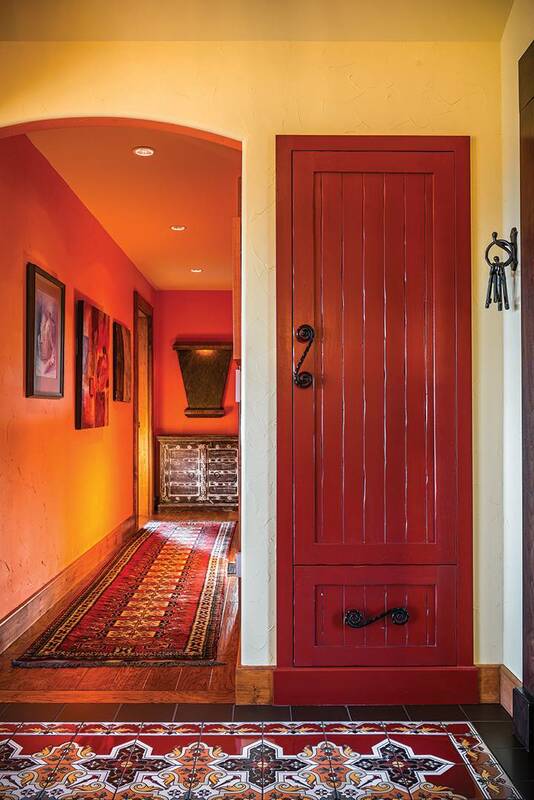 Faux wood beams, made from polyurethane and stained dark to match the real wood entryway door, adorn the home’s ceilings. 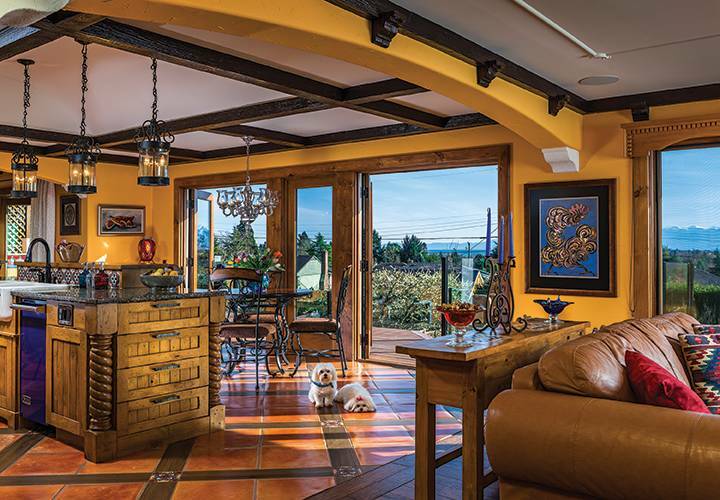 While real wooden beams are a feature of hacienda architecture, they would have proved too heavy to accommodate the home’s existing structure. Large floor tiles inset with smaller hand-painted tiles were hand-tinted on site; the diagonal placement adds visual interest. For symmetry, the wood flooring in the dining room matches that of the living room. “We interviewed four or five designers,” says Monica, who was born and raised in Mexico City. The project truly came to life when they talked to Ines Hanl of The Sky is the Limit Interior Design Concepts. Having owned a home in Merida on the Yucatan peninsula herself, Ines was familiar with the 18th-century hacienda style the couple wanted. “It was love at first sight!” Monica says of their creative collaboration. 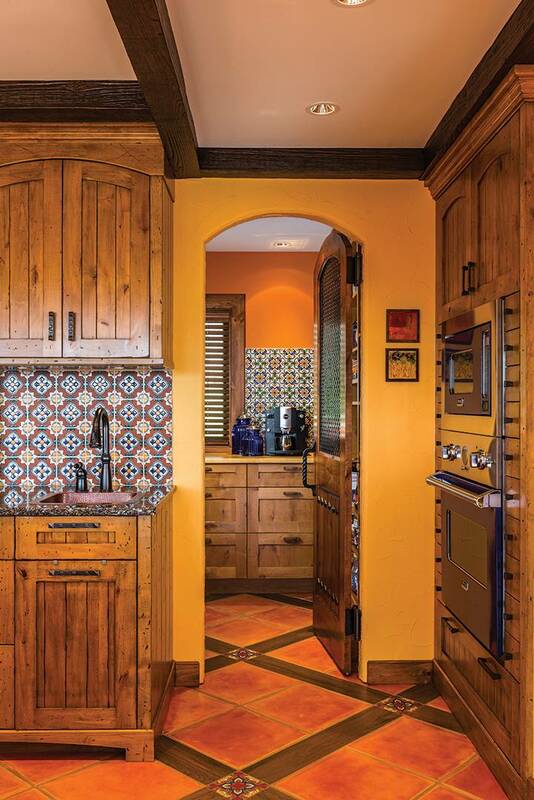 Colour infuses this home, from the hand-painted Mexican tilework to the azure-blue appliances and painted built-in niches, which are all offset by hand-distressed wood cabinetry and textured walls. 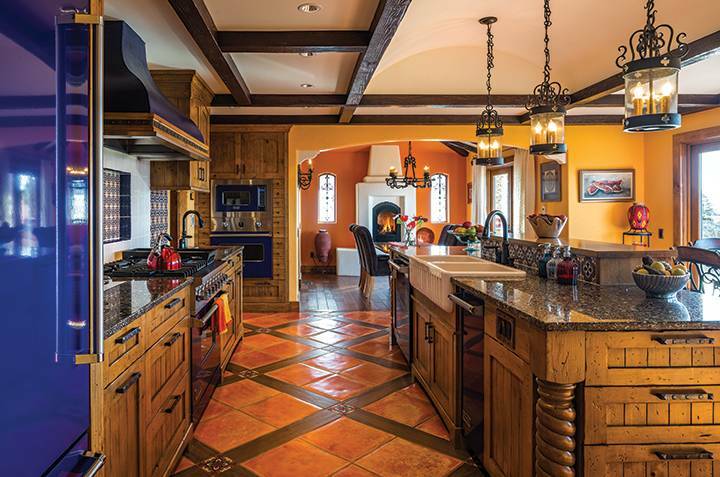 The home is a perfect balance of old world meets new world with just the right amount of wow factor. The dining room features a cathedral-style ceiling. The use of wrought iron sconces, chandelier and grille work in the windows provide hacienda authenticity. 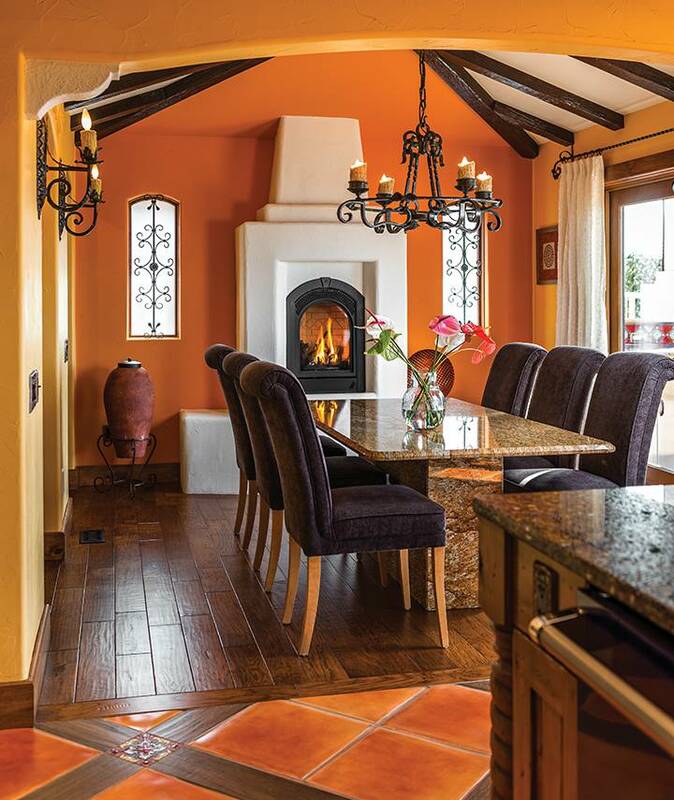 A wood-burning fireplace adds warmth and its smooth finish mimics adobe. The mango-coloured wall picks up the tile colour in the kitchen and offsets the fireplace. In order to accommodate the archways, some wall space and storage were lost; so the mudroom was converted into a pantry to hold small appliances and extras, and to keep the kitchen clutter free. A wooden door keeps the pantry and its contents out of sight. Ines Hanl designed a Moorish-inspired framework to give the dark-stained walnut door in the main entranceway further emphasis. 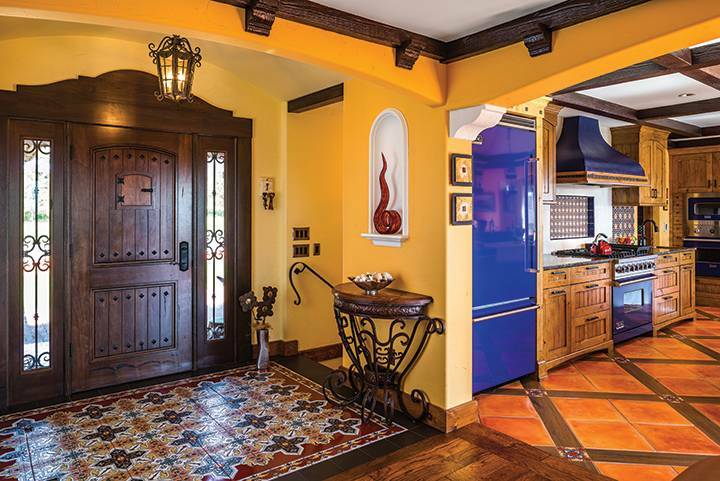 The barrel ceiling and the large hand-painted floor tiles give an overall feeling of grandeur when one enters. The placement of a water feature at the end of this long hallway imparts a calming effect. Although only one colour is used on the walls, the play of light gives the walls the tones of “a warm fruit salad,” Hanl says. Wrought iron hardware on the hallway closet adds a whimsical touch. 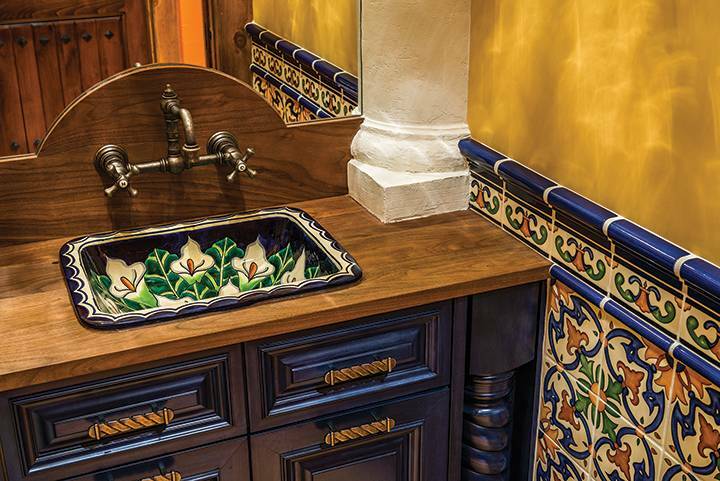 Dubbed by the Millers as the “calla lily room,” this powder room features dark blue-stained cabinetry, which is complemented by the dark blue in the hand-painted tile work. The use of columns on either side of the mirror adds a regal note.